BioPoint2 Stages | Ludl Electronic Products, Ltd. 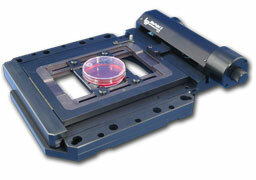 The BioPoint2 stages offer performance for less demanding and specialized applications. Originally developed for routine microscopy to provide a bridge between manual stages and high performance positioning stages, the BioPoint2 upright stage utilizes an open, flat design with a conventional ‘finger type’ specimen holder. An experienced microscopist will feel very comfortable with this configuration while at the same time enjoy the benefits of fully programmable positioning. The technology used in the the BioPiont2 stages provides high resolution smooth operation. A fine pitch leadscrew coupled with a high resolution stepper motor is designed to be smooth and quiet. The stage design is the most compact and user friendly configuration. Encoder feedback and motor options are not available on this stage. The BioPoint2 family of stages includes both upright and inverted versions. Both versions are available for most currently available microscopes.